The Dog Pyramid by Nina Ottosson lets your dog enjoy working towards treats. Treats fall out of the weighted pyramid, which constantly returns to the upright position. The game provides fun entertainment for pet and owner. The Dog Pyramid is a challenging game that will entertain your dog. The weight in the base helps the pyramid stay upright, ensuring lots of fun. More treats can be put in through the top of the pyramid. When the dog touches the pyramid with its paw or nose, the pyramid starts to wobble and tasty treats unexpectedly fall out. The Dog Pyramid by Nina Ottosson has difficulty level one. The Nina Ottosson Dog Pyramid falls under difficulty level 1. This means that this game is very suitable for dogs that still have to get acquainted with games and puzzles. Start with this easiest level to start with more challenging games later on. Is your dog crazy about hunting? Then the Dog Pyramid is perfect! 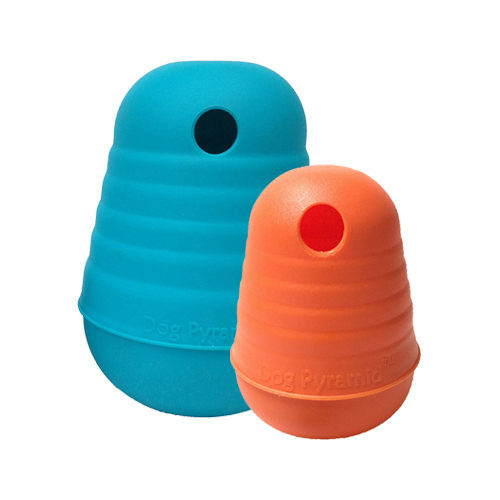 The Dog Pyramid combines a fun tumbler, tasty treats and the owner's attention in one fun game! Fill the game, in the presence of your dog, with tasty kibble. This way you will certainly attract the attention of your dog. Then place the tumbler on the floor. The game can start now! Reward your dog enthusiastically if it succeeds. This will make your dog more excited and try to grab even more treats. The first time you can help your dog with the game. Show how the treats fall out, so your dog will understand better. Is your dog finished? Then store the toy again. Your dog will be excited when he sees the toy again next time! Always stay with your dog when he plays with the Dog Pyramid. This way you can keep a close eye on whether all goes well. Teach your dog not to chew on the toy or toss the toy around. This way you can enjoy this fun toy for a longer period! Give your dog clear instructions to help him finish the game. Please note: Suitable for all dogs, regardless of age, breed or size. Make sure that this game is always given under constant supervision. The Dog Pyramid is made of recycled plastic, which can easily be cleaned with water and soap. Make sure there is no soap left in the game before giving it back to your pet. Have you used Nina Ottosson Dog Pyramid before? Let us know what you think about this product. My dog quickly worked out how to empty the kibbles out of the pyramid and enjoyed playing with the pyramid afterwards for a short while under supervision.